A nice feature you might want to add to your iOS app is to notify the user when a new version is available on the App Store. Of course the user can go to the App Store manually and install the update, but we've noticed quite a few users don't do this very often. Some carefully-judged prompting is bound to help. 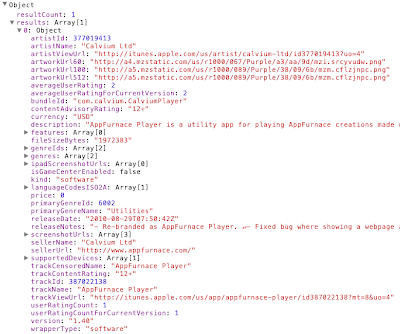 It turns out there's an API that Apple run that can return, in a handy JSON or JSONP format, the metadata for a particular app on the app store. This includes both the version number of the app, and even better, the 'what's new in this version' text. You can use this information on your app's startup to check if a new version is available, and tell the user what's in it, and then finally, link them to the update page for the app. Here's some bare-bones bits of example code to get you going. You'll need to know your app's Apple ID (e.g. 387022138). 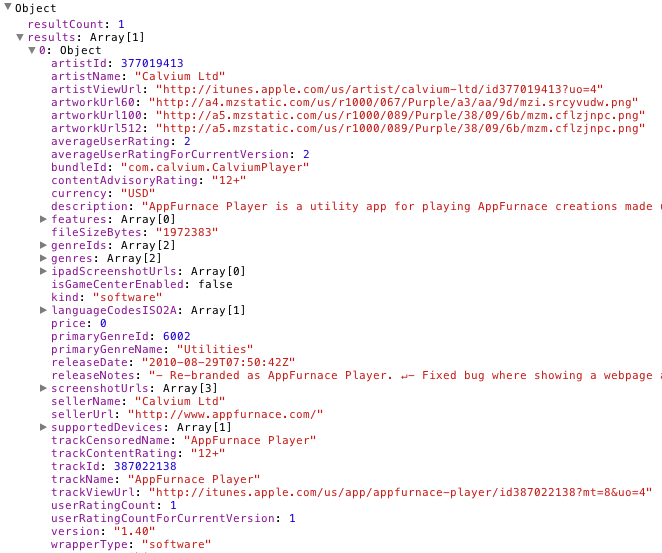 You can find this in the iTunes Connect interface). I'm also assuming that you're using jQuery or Zepto in your app. The below also works in the browser. // Alert the version number and release notes of an app. Screengrab showing properties of the response from the API call. Click to view full size.